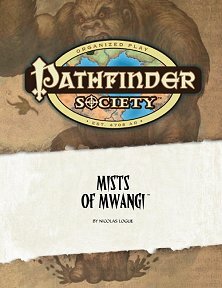 Mists of Mwangi is a Pathfinder Society Scenario designed for 1st to 5th level characters (Tiers: 1-2, 4-5). This scenario is designed for play in Pathfinder Society Organized Play, but can easily be adapted for use with any world. Publisher's blurb: "Pathfinder Lugizar Trantos recently returned from the Mwangi Expanse with haunted eyes and a pack full of strange idols. Absalom's famed Blakros Museum purchased his pieces and Lugizar vanished. The strange monkey idols he pulled from the misty jungles of Mwangi carry with them a fell curse, and now their power has laid claim to the museum. Can the Pathfinder Society uncover the source of the curse in time, or will the Blackros Museum be forever lost to the mists of Mwangi?"